Margaret Mead was not content to go on doing research the way she was ‘supposed’ to but neither was she maverick in her approach to how to gather data, analyse and interpret it. She was fully aware that her evidence had to be reliable and therefore whatever approach she used would have to withstand scrutiny. Professional doctorates, which encourage innovation in methodological approaches congruent with contexts, hold this tenet of evidence. Mead addressed methodological shortcomings in her own discipline of anthropology and offered insights into the future of research which should not prolong the polarisation between science and the humanities that had taken hold after the Renaissance but rather be harnessed in a complementary relationship that resulted in the common good. 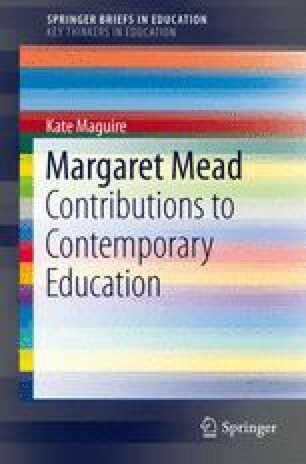 In his commentary on a collection of Mead’s works, Beeman (2004, p. xiii) says of her ‘methodological insights’ which she outlined in her essay ‘Towards a Human Science’ (1976) ‘the purpose of the essay is to try to forge a new philosophical statement about a fusion of the methods of science with the application for the good of humanity’.